The Kurdish-led administration in northern Syria has called for the creation of an international tribunal to try thousands of suspected members of the Islamic State (IS) group. 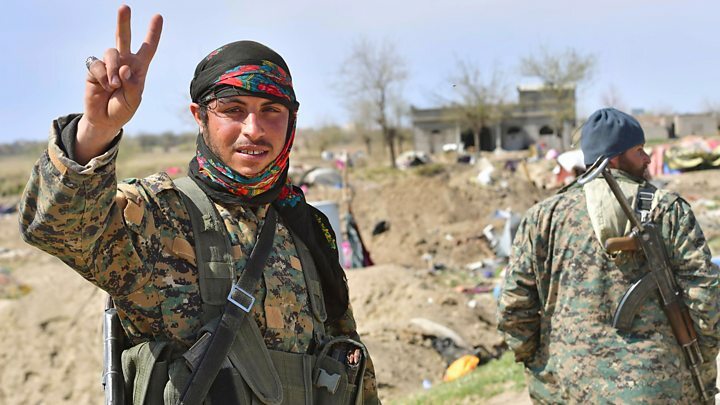 The US-backed SDF forces have reportedly captured more than 5,000 militants - from Syria and abroad - since January and put them in detention centres, while women and children are kept in camps for the displaced. According to one Kurdish official speaking to AFP news agency, more than 9,000 foreign relatives of IS members - many of them children - are being held at the Kurdish-run al-Hol camp. The accommodation was built for about 20,000 people but is now housing more than 70,000. Meeting Kurdish officials, their frustration with Western countries becomes all too clear. The administration's foreign affairs chief told me he felt the Kurds had been left to deal alone with the detention of IS members and their families with no plan in place as to what happens next. It has struggled to cope with even detaining the militants it has captured, let alone putting them on trial. He said he had been hugely disappointed in countries who had revoked the nationalities of their citizens who had joined IS, saying the Kurds had already suffered so much loss in living under IS and then fighting the militant group. His warnings were stark; that leaving dangerous members of IS in an unstable region held by an administration ill-equipped to process them was asking for trouble; and leaving children to remain surrounded by the harmful ideology into which they were born was storing up profound problems for the future. US envoy for Syria James Jeffrey told reporters on Monday the focus was on repatriating militants, and "getting countries to take back their own foreign terrorist fighters". Iraqis and Syrians should be sent home "for deradicalisation and reintegration or in some cases punishment", while countries around the world should be encouraged to "take back their own citizens". However, some have pointed to the case of Hoda Muthana, a woman from Alabama who left the US in 2014 to join IS and has now been refused permission to return to the US by Secretary of State Mike Pompeo, a decision backed by President Trump. Mr Pompeo says she was never a US citizen, but her family disputes this. Asked if the US was considering an international tribunal, Mr Jeffrey said: "We're not looking at that right now." Could an international tribunal work? There have been several international tribunals in the past, including to try war crimes in the Balkan conflicts of the 1990s and after the Rwandan genocide in 1994. Since 2002, the International Criminal Court has served as a permanent international tribunal but the Rome Statute establishing it has not been ratified by Syria.